Prepare for the exam with practice tests written by current examiners. This write-in book contains four new extended practice tests that help students prepare confidently in the weeks before the Cambridge IGCSE English as a Second Language exam. By completing the tests, learners develop familiarity with the format of the assessment and enhance their reading, writing, speaking and listening technique. This edition does not contain answers at the back of the book, making it suitable for classwork or homework. Audio for the listening exercises is online at cambridge.org/education/igcse-esl-tests. This ‘without answers’ edition is ideal for use in class or as homework. The only resource of its kind written by examiners to the specifications of the revised syllabus for reliable support. The resource contains oral exam prompts and audio to help students with the speaking and listening aspects of the exam. 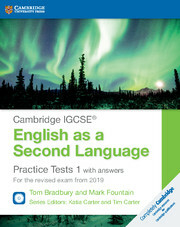 You can use the book alongside any Cambridge IGCSE coursebook as a source of mock tests, and in the important weeks before the exam to give helpful practice. The ‘with answers’ edition is ideal for teachers checking students’ work or for self-study learners. It comes with CDs containing audio for the listening exercises.